Typically reserved for the book you read before you go to bed, your phone charger, a glass of water and a myriad of other bits and bobs you may throw its way, the lowly bedside table is definitely a practical piece of furniture, but not one to be overlooked. A bedside table's contents can speak volumes about its owner's character and preferences - literary, floral, colour and even wake-up predilections. But perhaps more so than its contents, the bedside table itself can be the embodiment of your interiors style - boho, classic, shabby chic, modern, minimalist... whatever style you consider yourself to be, or maybe a fusion-style, your nightstand is the perfect way to show off your design aesthetic. We spend a lot of our time in bedrooms, it comes with the job (! 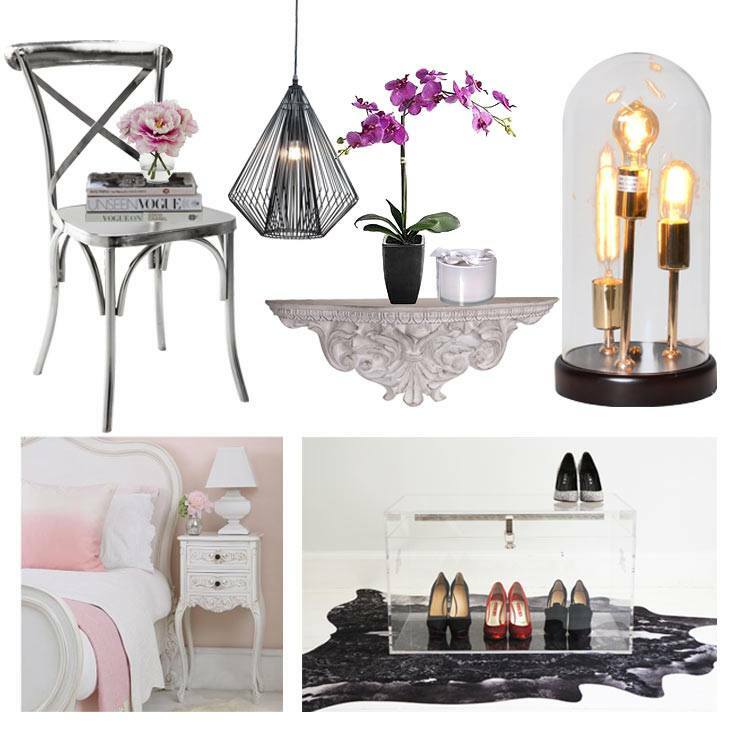 ), so have come up with 8 ways you can personalise your bedside - from quirky to classical, modern to shabby-chic. A stack of magazines or books makes a great bedside table and you'll never be short of reading material on sleepless nights. This isn't one for those wanting an abundance of storage, but a pile of white Vogue magazines for a modern fashionista is a superb style statement whilst a tower of leather bound classics can offer continual inspiration for the romantic Bronte fan. This can be a fun DIY project and fits with the Scandi style aesthetic of bringing beautiful pieces of nature into the home. 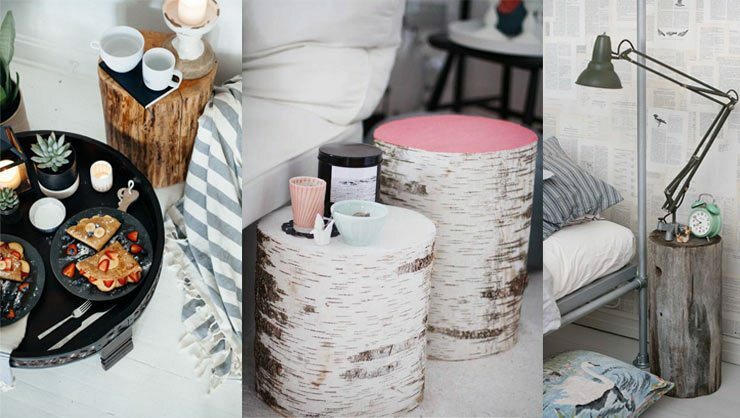 Keen to get more naturally inspired pieces into your home? See our Migration Blog. A simple stool makes for an excellent minimalist nightstand and when in need of a quick seat or step up, you can clear your stool - a utilitarian bedside if ever there was one! Whether a pile of vintage, earth toned trunks, a treasured antique Louis Vuitton trunk (ah, a girl can dream) or a trio of more contemporary pastel toned metal cases, trunks offer storage for items you don't need easy access to - spare blankets, winter jumpers and seasonal handbags. There's always the more classical bedside in many shapes and sizes - we're not all blessed with metres of bedside space, so if you need to maximise what you have a "purpose built" bedside would be the best option. Although conformist in their function, there are most definitely styles, shapes, sizes and colours to suit all bedrooms. Seen (or have) a chair you simply can't live without but just don't have the space for it in the bedroom? Double up its use and have it as a bedside table! A vintage set of steps makes for an excellent multi-layered bedside - adorn with your favourite scarf or hung dress for a truly personal touch. The ultimate in minimal bedside style, a suspended shelf is simple - thoughtful and practical. Partner with a low hung, exposed element light for a truly on trend bedroom feature. Transparent Trunk, £580; Provencal Perfect Bedside Table, £158.